As the school year ends for Chicago Public Schools, Urban Initiatives set aside time to congratulate our Take the Lead participants for a year of success. 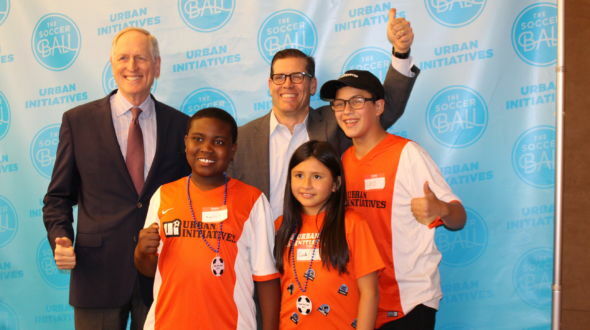 With the help of William Blair, Urban Initiatives hosted 80 Team Captains at the brand new 150 North Riverside Plaza for a night of awards, recognition, and fun. Urban Initiatives was honored to be the first group to make use of the new space beautifully located on the Chicago River. The Take the Lead program Team Captains and a select group of parents were treated to dinner by William Blair to recognize a year of hard work and dedication. Students participated in activities, chatted with William Blair representatives, and were offered a chance to reflect on their best memories from the year. Laura Coy and Dave Coolidge from William Blair addressed the students. Coolidge offered advice to students as they begin to enjoy their summer breaks. He stressed that summers are a time to continue to make use of the skills they have learned with Urban Initiatives and to further their education through reading and other activities. The evening was an exciting celebration of the various achievements accomplished by each school. Schools were recognized on the basis of GPA, attendance, and leadership. Students received ribbons and watches to honor their accomplishments. Additionally, Urban Initiatives’ eighth grade students were given special recognition for graduating from middle school and concluding their time with the Take the Lead program. These exemplary students were awarded plaques, letterman-style jackets, and Urban Initiatives pins. The programming portion of the evening concluded with students taking the stage to share some of their favorite Urban Initiatives memories with the crowd. The sunset over the Chicago River at 150 North Riverside provided the perfect backdrop for the evening’s congratulatory and commemorative activities. 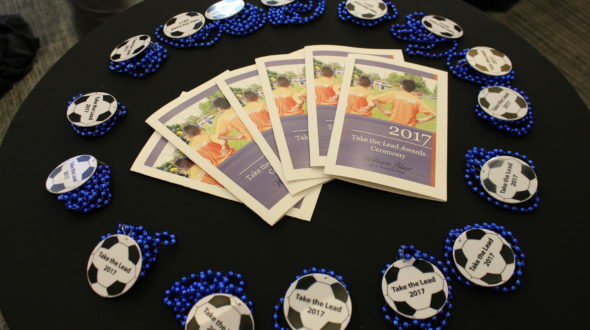 Urban Initiatives deeply appreciates the support of William Blair, the parents who support our Team Captains, and everyone else who made the Take the Lead Awards Ceremony possible. Urban Initiatives looks forward to many more celebrations of student achievements in the future and we wish all of our students a happy summer break.